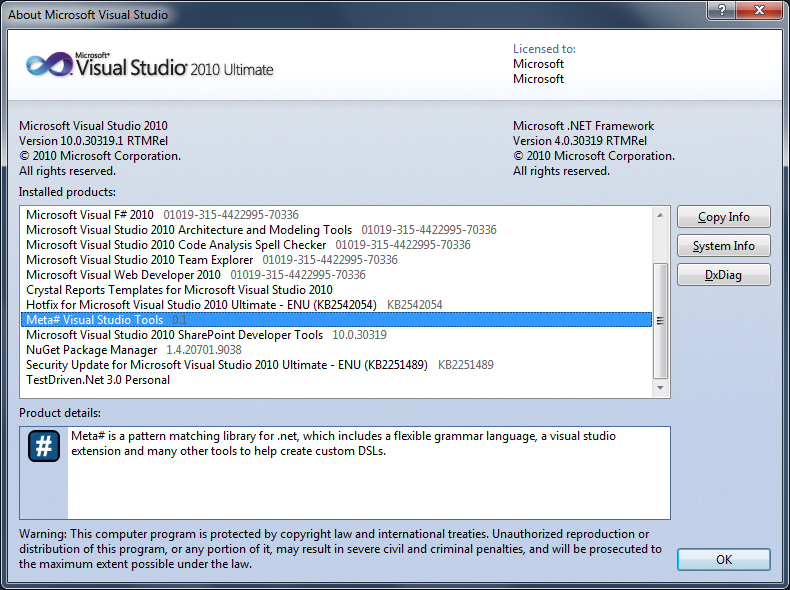 This package is .net 2.0 now too, so you can use it in more places (such as Unity3d). I’m planning on putting the actual grammars and build tasks etc into other packages so that the main package remains very portable. Also I changed it so that ‘p’ in the above scenario is a Pattern ast object instead of a Delegate. Which means that you could theoretically visit the pattern and transform it, itself. Also tracing produced objects will give you the pattern that produced it as well as the metadata. I hope that makes sense. 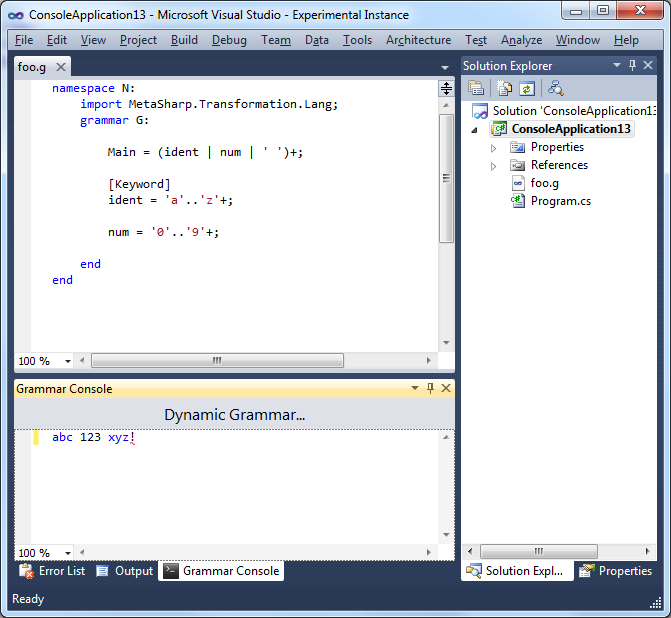 My first attempt made use of generics to attempt to flow static typing through the productions (which is definitely possible) but the insufficient type inference and support for monads in C# caused the complexity of the patterns to be unbearable. 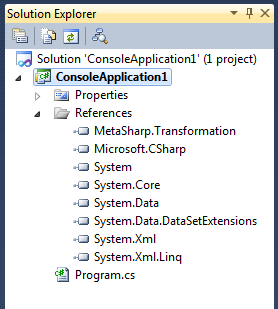 I found that if you use object and DynamicInvoke instead, you get similar results with reasonable complexity. The end result is that this api isn’t strictly monadic, since there is no Bind or Select/SelectMany. But it is monadic in spirit, all of the objects involved in the pattern matching operation are immutable and are safely parallelizable, except possibly your custom productions. I’m pleased with the performance so far, the Or pattern executes each branch in parallel. I haven’t really stressed it that far yet but my 210 unit tests take about .45 seconds to run total so that seems pretty good. I want to create a Reflection.Emit visitor so I can get even better performance for rules but, unfortunately, that API isn’t available on all platforms (e.g. WinRT) so I’m not sure how best to do that. 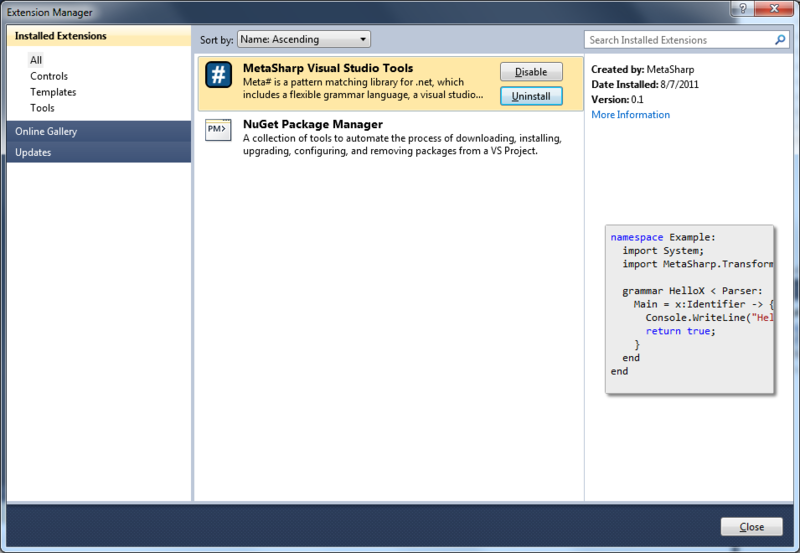 The next big step is to create a new package with a C# grammar + roslyn transformer. Before it was a 1-off language. 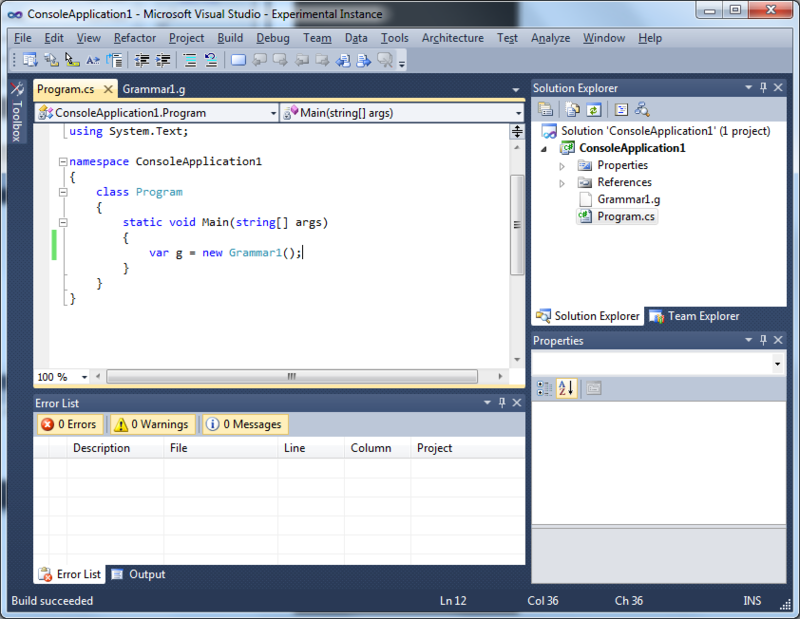 This time I plan to redo that work except as C# so that it is more appealing to users. 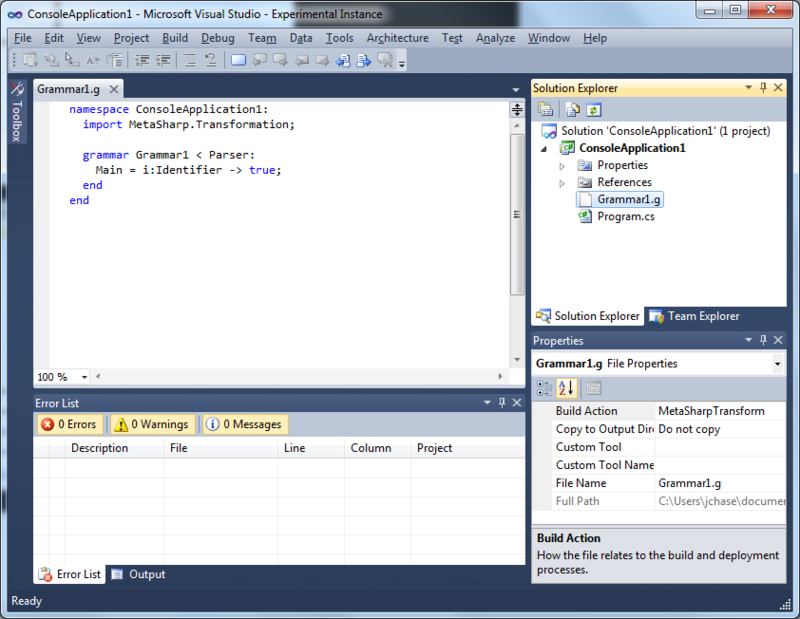 I also want to change the grammar language to not be inheritance based, but compositional. This will require a little experimentation but I think it will make it a lot more appealing. The lack of extensibility in Roslyn is a real bummer because as far as I can tell there is no way for me to easily extend Roslyn to add pattern syntax to C# that way. 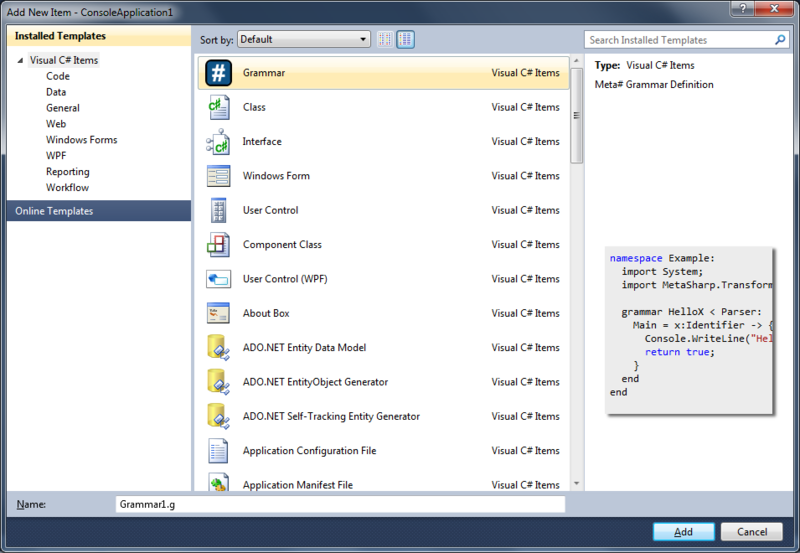 The result is that I can leverage roslyn to generate assemblies from my AST but I still have to implement my own C# grammar if I want to extend it. A bummer but not harder than what I did before. This is far from polished and complete but here you can see the grammar defined in foo.g being dynamically compiled and used to parse the text in the grammar console. You can see how the [Keyword] attribute is used to generate syntax highlighting in that grammar window also, as well as automatic error generation for the errant ‘!’. Next up is visualization of the node graph produced by the parse as well as error information. Very promising progress though! 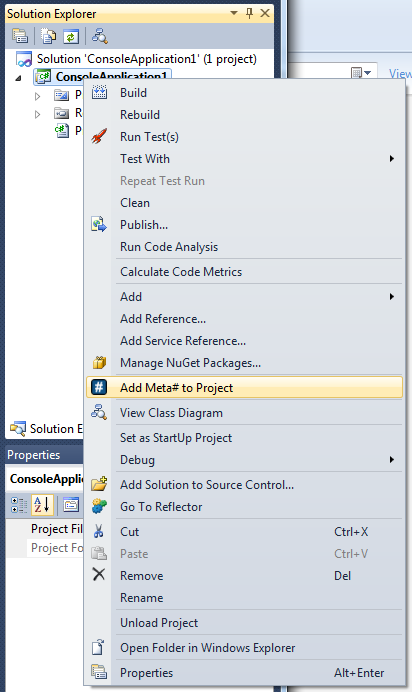 I’ve been working on improving error handling in meta# for the last couple of weeks. Previously there was no support and basically your code would either parse correctly or it would not. So I cracked open the Purple Dragon book, dug into Martin Fowlers DSL book, asked on the OMeta forums and read about how some other grammar tools do error handling. It would probably have helped to have someone sit down and show me but I had a real hard time understanding exactly what the various solutions were. But other than not fully getting the specifics I think I got the general idea and was able to add two new error handling semantics to meta#. Parsing errors basically all boil down to a single type of problem: the thing that is next in the stream is not what you were expecting. I decided that you could look at this problem two different ways. You could either say that something you expect is missing or something you didn’t expect is present. So I added two new pattern semantics “error unless X” and “error until X”, where X is any pattern. In the case of “error unless”, that is like saying something you expected is missing. In this case an error will be logged, input from the stream will not be consumed and null will be returned rather than fail. This will let whatever rule that uses these semantics to still project and give you a very specific message and if the following code is well formed the parser could even recover without any additional errors. This is very useful for missing ‘;’ at the end of statements. For “error until”, it is like saying something you were not expecting is present. In this case all of the input will be consumed until the X pattern is matched. An error will be reported and fail will be returned. This is very good for sync’ing to the next close bracket because it will read all unknown input and treat it as an error. One last way to report errors is just by calling context.LogError(…) from within a projection. Then you can handle more complex cases and log arbitrary error messages. I might have to expand the api for this but here is an example of how I’m using it so far.